This week's cover story, "Shifting Gears," takes an in-depth look at how Oakland can redesign its streets to support alternative modes of transit and become a world-class city for bicycling. As part of my research for the piece, I spent time with the city planners at the forefront of bike and pedestrian planning in Oakland — the Public Works Agency transportation officials who decide where and how to remove car lanes and implement new bike lanes. They explained to me how the city has slowly expanded its network of bikeways after implementing Oakland's first bike lane on a roughly one-mile stretch of West Street in 1997. Now, the city has about 52 miles of on-street lanes specifically for cyclists and a total network of 146 miles of designated bikeways (which includes recreational bike paths and roads with so-called "sharrows," meaning markings on the ground indicating that cars should share the road with bikes). 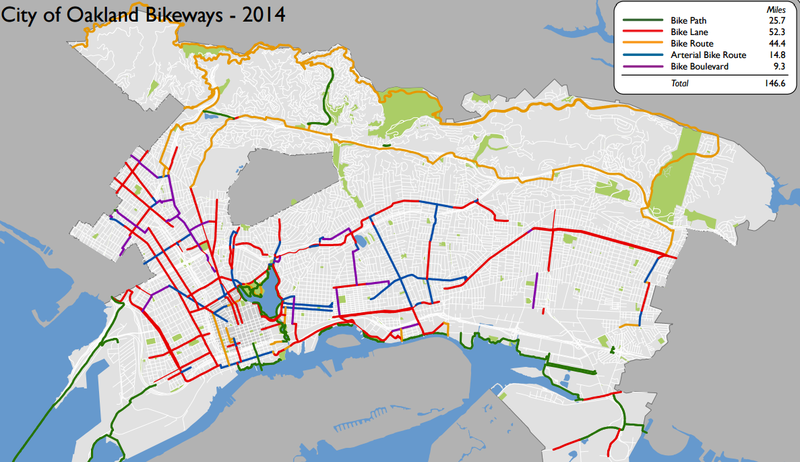 To get a better sense of how Oakland has expanded its bikeways over time, you can check out this city report, which details bikeway mileage increases over time, along with this timelapse animation, which shows the geographic changes in the bike lane network in recent decades. 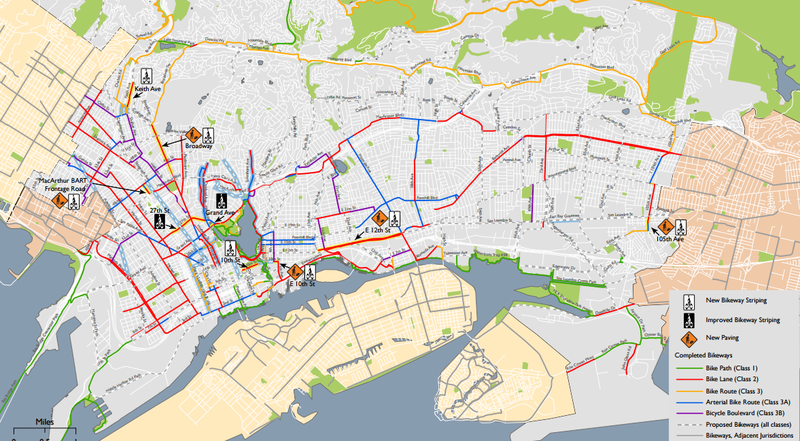 And here's an up-to-date bike map from the city (click on the images below for larger versions). The green lanes are recreational, separated bike paths (like the new Bay Bridge bike route) and the red lines are the more traditional bikeways (on-street lanes designated specifically for cyclists). The rest of the markings on the map are streets that are official cycling routes that generally have less sophisticated designs (like sharrows). Additionally, this map from the city's recent bike newsletter also shows routes that the city believes need bikeways and are included in the city's 2007 Bicycle Master Plan, which calls for a total of 245 miles of bikeways. 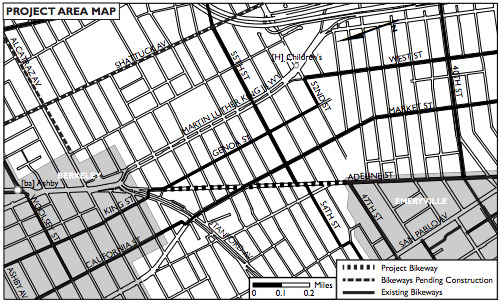 The proposed routes are marked by the grey and white striped markings (many in East Oakland). 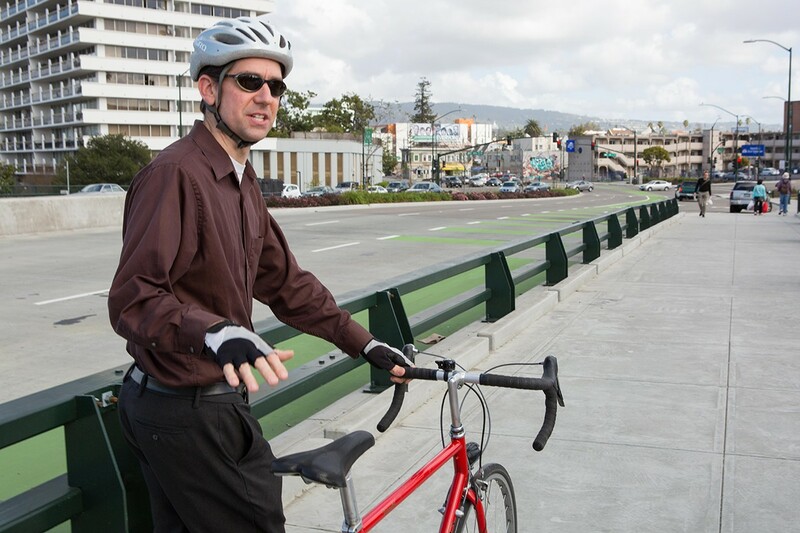 Jason Patton, the city's bicycle and pedestrian program manager, gave me some details on new bike infrastructure projects Oakland residents can expect to see over the next two years. In no particular order, here are ten bike projects now in the works. The most high-profile bike infrastructure project coming to Oakland is part of the city's so-called Telegraph Avenue Complete Streets Plan, which is a major redesign of one of the city's most dangerous roads. The plan, which the city council approved in December for implementation this summer, includes the city's first-ever "cycle track" or "parking-protected bike lane," meaning a bike lane adjacent to the curb and separated from motor vehicle traffic by a lane of parking to the left. 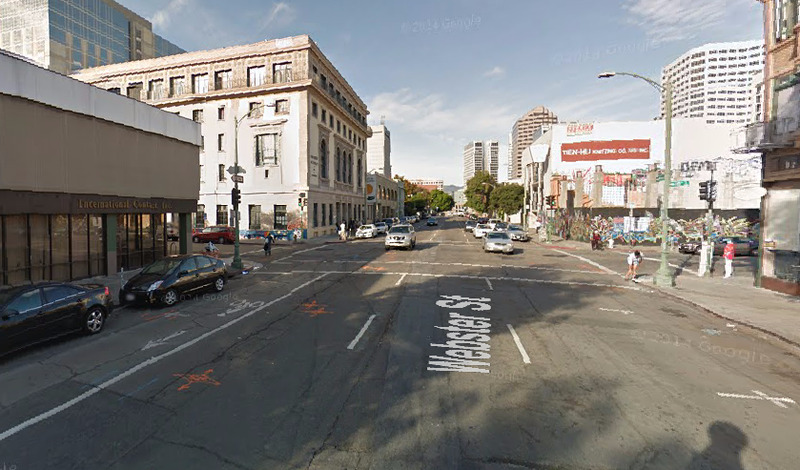 The city will install that protected lane design from 20th to 29th streets on Telegraph. From 29th to 41st streets, the city plans to create buffered bike lanes, meaning more traditional bikeways separated from cars by a painted strip. For more details, check out our coverage from December, "Oakland Approves First Protected Bike Lane." This year, the city plans to add new bike lanes on Adeline Street in the Santa Fe neighborhood. As part of this project, the city will redesign the road to have only two car lanes, instead of four, which the city expects will slow traffic in the residential area and improve pedestrian safety. This project extends from 47th to 61st streets on Adeline. You can read details here. 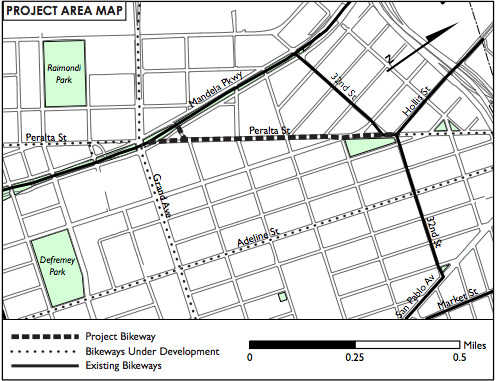 In West Oakland this year, the city plans to install new bike lanes on Peralta Street from Mandela Parkway to 32nd Street as part of a scheduled paving project. The city will accomplish this by reducing the wide travel lanes there to standard widths, making room for cycling lanes. You can read full details of the project here. 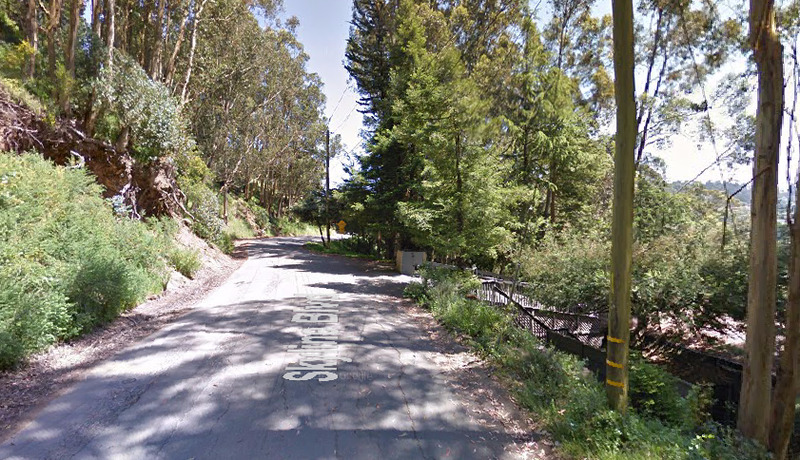 In the Oakland hills this year, the city plans to resurface Skyline Boulevard from Snake Road to Pinehurst Road — a project that public works says will improve the pavement for bicyclists. In addition to implementing new bike lanes throughout the city, Oakland's bike planners have also worked in recent years to upgrade existing designs. One method is to add additional stripes known as buffers, which can help cyclists avoid car doors to the right or uncomfortably close drivers to the left. As part of a paving project, the city will be doing this type of upgrade this year on Webster Street's existing bike lane, between 14th Street and Grand Avenue. Also scheduled to be constructed this year is a regional bike path in East Oakland as part of a project known as the East Bay Greenway. This separated bike path will give cyclists a safe place to ride along San Leandro Street from 75th Avenue to 85th Avenue. For more details, check out this fact sheet from the Alameda County Transportation Commission. In 2016, Oakland plans to construct a protected bike lane (meaning one physically separated from car traffic) on Broadway at Keith Avenue in the Rockridge district. Notably, this project will also include Oakland's first bicycle traffic signal, meaning a traffic light specifically for cyclists to help them guide them through a difficult intersection while cars are stopped. 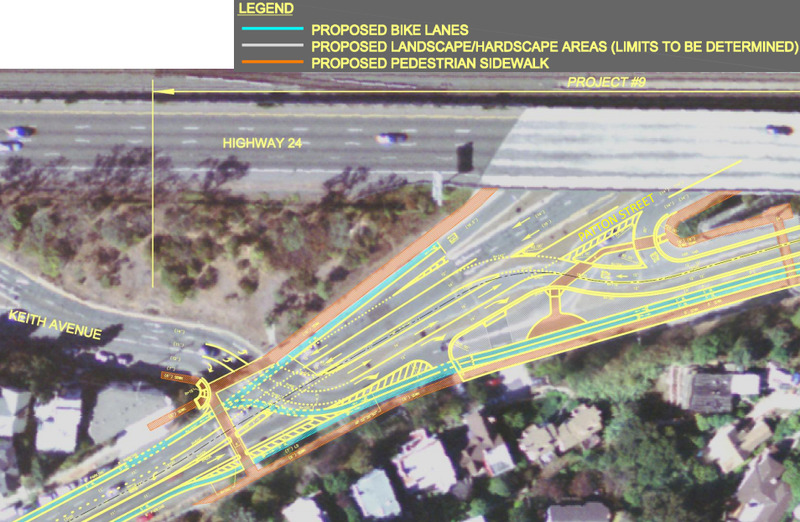 This street redesign will be the first in a series of projects aimed at improving bike and pedestrian access in the vicinity of the Caldecott Tunnel. For more details, check out these maps the city sent me. 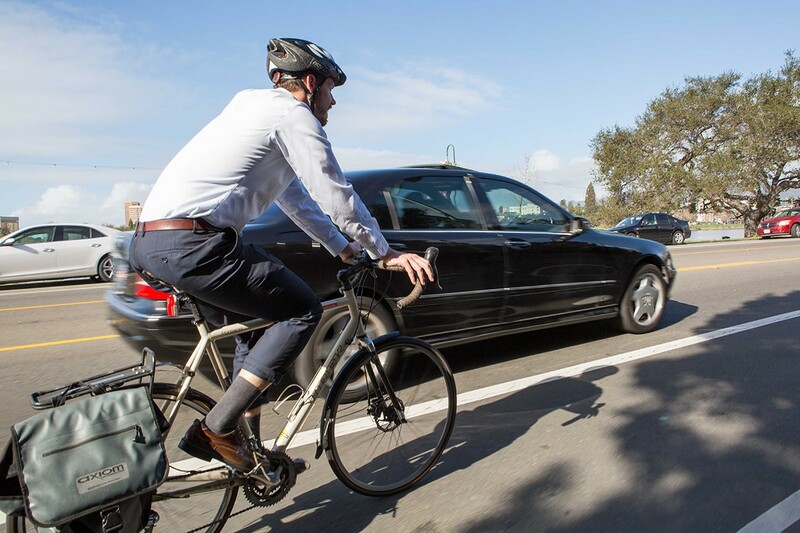 In an effort to improve connections between Lake Merritt BART and the surrounding neighborhoods, the city in 2016 plans to construct new bike lanes on 8th and 9th streets and on Oak and Madison streets. Those lanes will provide better bike routes from the BART station to Jack London Square and to Lake Merritt. Oakland's Measure DD, a bond measure that has funded a range of projects around Lake Merritt, will support these initiatives. Jason Patton, bicycle and pedestrian program manager, standing by a green bike lane. In addition to installing buffers on existing lanes, the city has improved designated bike routes by adding bright green paint in certain areas — aimed at helping cyclists ride through dangerous intersections. The green lanes are designed to target intersections that have high collision rates or are "conflict zones," meaning areas in which motorists have to merge across cycling lanes. 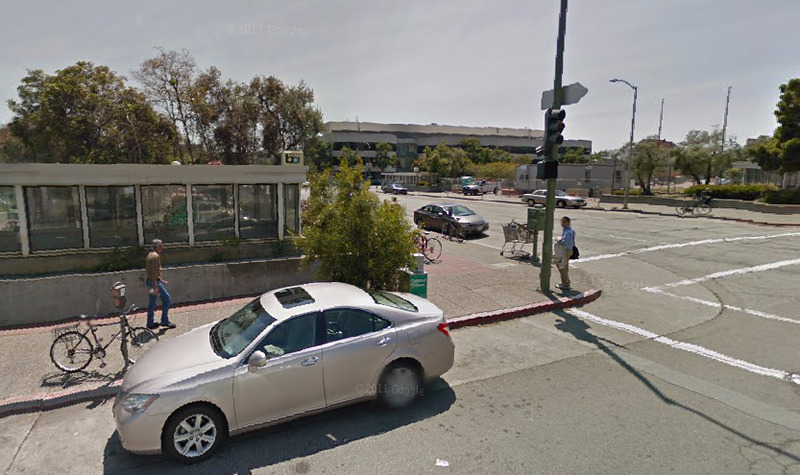 There are currently ten green lane designs in the neighborhoods surrounding Lake Merritt. This year, the city will implement green bike lanes at three new locations on Grand Avenue and MacArthur Boulevard in the Grand Lake neighborhood. Though not a specific street infrastructure project, the expansion of Bay Area Bike Share to the East Bay could be transformative for cycling in Oakland. The bike share program — which currently is in place in San Francisco, Redwood City, Palo Alto, Mountain View, and San Jose — is on track for a 2016 rollout in the East Bay.